Along with physical strength, a little exercise helps kids build brainpower. Forget the term "dumb jocks." According to the latest research, that's an oxymoron. New findings from biology and education research show that regular exercise benefits the brain in numerous ways. "Memory retention and learning functions are all about brain cells actually changing, growing, and working better together," says John J. Ratey, clinical associate professor of psychiatry at Harvard Medical School and the author of Spark: The Revolutionary New Science of Exercise and the Brain. "Exercise creates the best environment for that process to occur." Although researchers aren't exactly certain how exercise leads to better cognitive function, they are learning how it physically benefits the brain. For starters, aerobic exercise pumps more blood throughout the body, including to the brain. More blood means more oxygen and, therefore, better-nourished brain tissue. It wasn't until recently that researchers turned their interest to children -- in whom exercise may have more impact. The brain's frontal lobe, thought to play a role in cognitive control, keeps growing throughout the school years, says Charles Hillman, associate professor of kinesiology and neuroscience at the University of Illinois. "Therefore, exercise could help ramp up the development of a child's brain," he says. "There was a relationship to academic performance," says Hillman. "The more physical tests they passed, th­e better they scored on the achievement test." The ef­fects appeared regard­less of gender and socioeconomic differences, so it seems that regardless of his or her race or family income, the fitness of a child's body and mind are tightly linked. The bigger the dose of exercise, the more it can pay off in academic achievement. In a study published the same year in the Research Quarterly for Exercise and Sport, researchers found that children ages 7-11 who exercised for 40 minutes daily after school had greater academic improvement than same-aged kids who worked out for just 20 minutes. Phillip Tomporowski, professor of exercise science at the University of Georgia, and one of the team members who conducted the study, says much of the research today seems to negate the old notion that recess sends kids back to class more hyper and rowdy. "It appears to be the other way around," he says. "They go back to class less boisterous, more attentive, and better behaved compared with kids who have been sitting in chairs for hours on end." Hillman also tested that notion in a study published this year in Neuroscience and found that kids had more accurate responses on standardized tests when they were tested after moderate exercise, as opposed to being tested after 20 minutes of sitting still. His results lend support to the idea that just a single aerobic workout before class helps boost kids' learning skills and attention spans. Naperville Central High School, in Naperville, Illinois, has put that idea into practice for nearly four years. It started when officials created learning-readiness PE in 2005, an early-morning class for 12 students who needed extra help with literacy skills. For 30 minutes, they rotated through aerobic activities, wearing heart monitors to ensure that their heart rate was in the target zone of 160-190 beats per minute. Then they joined other students, who had not exercised, in a special literacy class. 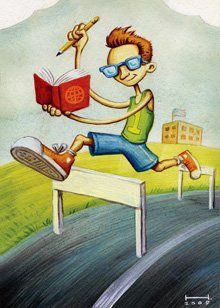 According to Paul Zientarski, the school's instructional coordinator for physical education and health, students who took PE prior to class showed one and a quarter year's growth on the standardized reading test after just one semester, while the exercise-free students gained just nine-tenths of a year. He then used the same approach for math-troubled students, scheduling some in PE before an introductory algebra class. The results were even more dramatic; exercising students increased their math test scores by 20.4 percent, while the rest gained 3.9 percent. "It doesn't matter if they work out in the morning or afternoon, just that they're in the class right after PE," says Zientarski. "It calms them down, it makes them more willing to learn, and they feel good about themselves." So, which types of exercise are best for brainpower? Hillman and other researchers tout aerobic and cardiovascular activities, such as running, swimming, and playground games. "In my studies, only cardiovascular exercise was related to higher academic performance," he says. Naperville also focuses on cardiovascular exercise. However, in addition to running sprints and jumping rope, students do juggling, gymnastics, and tumbling, which require concentration and provide positive stress to the brain, which helps learning. Zientarski's program is an admired model for gym classes nationwide, and it's all the more notable at a time when schools are cutting back on PE and reducing recess hours. In fact, Illinois is the only state that requires daily PE for all grades. "Others are working toward it, but it's a huge challenge with budget restraints and No Child Left Behind," says Shanna Goodman, communications manager for PE4life, a nonprofit organization in Kansas City, Missouri. Her organization has trained some 250 schools nationwide to create productive PE classes and recess activities. One inner-city school in Kansas City, after implementing PE4life, boosted PE from one day to five days a week. In a year, cardio fitness scores shot up 200 percent, and the school saw a 59 percent decrease in disciplinary incidents. In rural areas, PE4life has helped schools such as Titusville Middle School, in Pennsylvania, incorporate activities including snow­shoeing, cross-country skiing, and skateboarding into PE. Of course, teachers can reap rewards from exercise just as their students do. To manage body weight and prevent unhealthy weight gain, the U.S. Department of Agriculture recommends 60 minutes of moderate to vigorous exercise most days. Researchers believe that the more regular your exercise routine, the more long-term benefits your brain will get. So it's important to keep working out regularly. Try your own 20-minute romp around the playground or the gymnasium. A regular workout will make both you and your students feel like "smart jocks" for the rest of the school day. Vanessa Richardson is a freelance writer in San Francisco.